Last week I was in Jefferson City attending a social function for a friend. The dinner was held in a popular downtown restaurant. It was so good to see old friends but I could not get over how difficult it was for me to eat in a restaurant that allowed smoking. Jefferson City is not a clean air community and as soon as I opened the door of the restaurant, the nasty smell of cigarette smoke filled my senses. As I returned to Kansas City, I couldn’t help but notice the smell of cigarette smoke in my clothes and in my car. As soon as I got home I took a shower and washed my clothes. The Kansas City region has done a good job a supporting clean indoor air laws. However, recently two local communities have passed clean indoor air laws that have big loopholes in them. 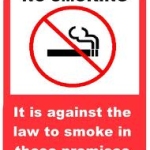 These loopholes allow most bars and restaurants in their community to continue to allow for smoking. Recently, the Kansas Health Institute issued a research paper studying the economic effects of the smoking ban on bars and restaurants in Lawrence, Ks. The results of this research are similar to virtually every other study conducted in different communities who have implemented a smoking ban . These studies all showed that business at bar and restaurants were not adversely affected in the long run. The health of our community is too important to allow cigarette companies, bars and restaurants to use economic excuses to explain why a smoking ban is not warranted. As KHI and other studies show – these economic excuses are simply not true . Now is the time to implement state wide clean indoor air smoking bans.